Each design begins with a drawing of the artist's vision inspired by nature and imagination. All models are painstaking sculpted by hand from wax then cast in sterling silver. Mixed metal sterling and gold pieces require a painstaking process utilizing a separate casting and soldering to bring together a seamless creation. Each piece is meticulously hand finished by skilled artisans to insure precision, detail and quality. The final piece of jewelry is a work of art that is three dimensional, interpretive sentimental and collectable. 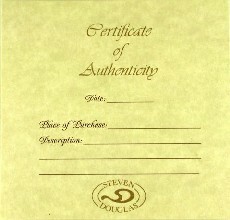 All Steven Douglas Jewelry Creations come with certificate of authenticity.